The problem is the battery is not charging. Pull off the 2 yellow wires from G terminals. With engine off and Master switch off, resistance between the two wires should be 0.1 - 0.8 Ohm. Resistance between either wire and ground should be infinite; that is, there is an open circuit. With engine running and the two wires still off the regulator, test AC voltage between the two wires. If the resistance between the plus and minus poles of the capacitor is not infinite, that is, it is not an open circuit, then the capacitor has failed and must be replaced. With Master switch on: Measure the voltage between ground and the wire on the R, B+ & C terminals in turn; it should be the battery voltage, about 12.5 VDC. With Master switch off: The above test should show 0 voltage for all three cases. 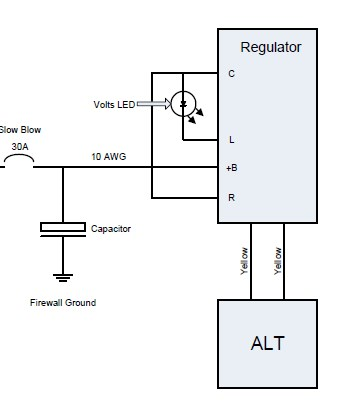 Resistance between regulator housing and battery ground should be essentially 0. If the wiring fails any of the above tests, the wiring problem needs to be isolated and fixed. If the wiring passes the above tests, yet output voltage of the regulator/rectifier is not in the normal range, then the regulator/rectifier likely is faulty and should be replaced. My understanding is that this is a wiring problem, no voltage is getting to the reg/rect... but I am worse than a novice at this – a little knowledge is a dangerous thing! The aircraft is wired basically according to the Europa build manual (below or attached, depending how you are viewing this). Any clues as to where I should begin looking? It would appear that the AC part of your system is working ok. What DC voltage do you get when you put the positive probe on the Reg +B and and the black probe on system ground? This should be about 13.4 to about 14.2 VDC depending on the RPM of the engine, From you diagram, I do not see where the regulator is attached to system ground. Is the case of the regulator intended to be connected to system ground or was term L or R intended to be system ground?? Your capacitor is grounded but there is no indication of how the regulator ground circuit is completed?? i also have a third item to check.. in doing all of the testing below... the battery voltage on r b ,c showed 2volt. I didn't test the VDC with the engine running - I will do that tomorrow and report back. Yes, the regulator case is grounded (I shall update the wiring diag). Paul your test results show you are not connecting the battery to C B+ R on the regulator you need to check why has fuse blown or is master switch contact faulty some circuits I have seen use a seperate contact to connect alternator the led connected to L should light with engine stopped if battery supply is connected to regulator.